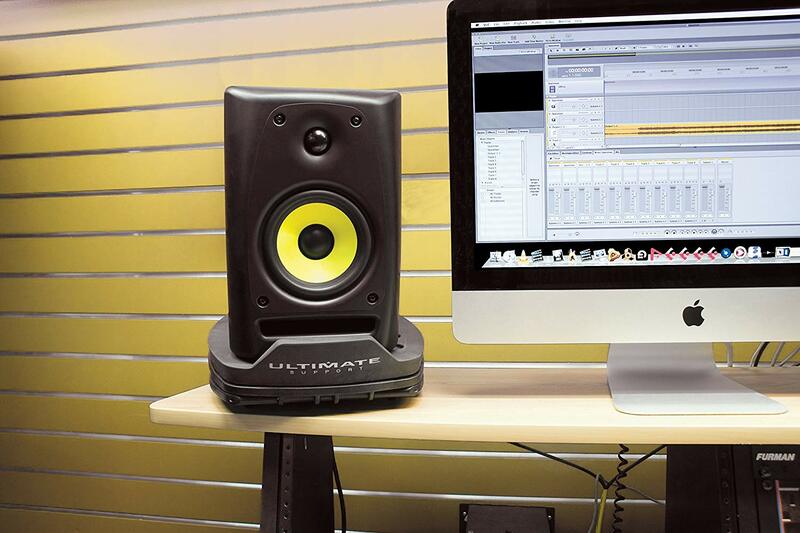 Getting the right speakers is one thing, however getting them set up correctly will make a world of difference and this is where decent studio monitor stands become important. 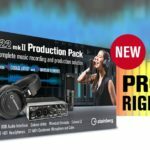 We all have varying needs, some of us have a confined home studio setup and need to work within limitations, others have the space to use floor-standing studio monitor stands. 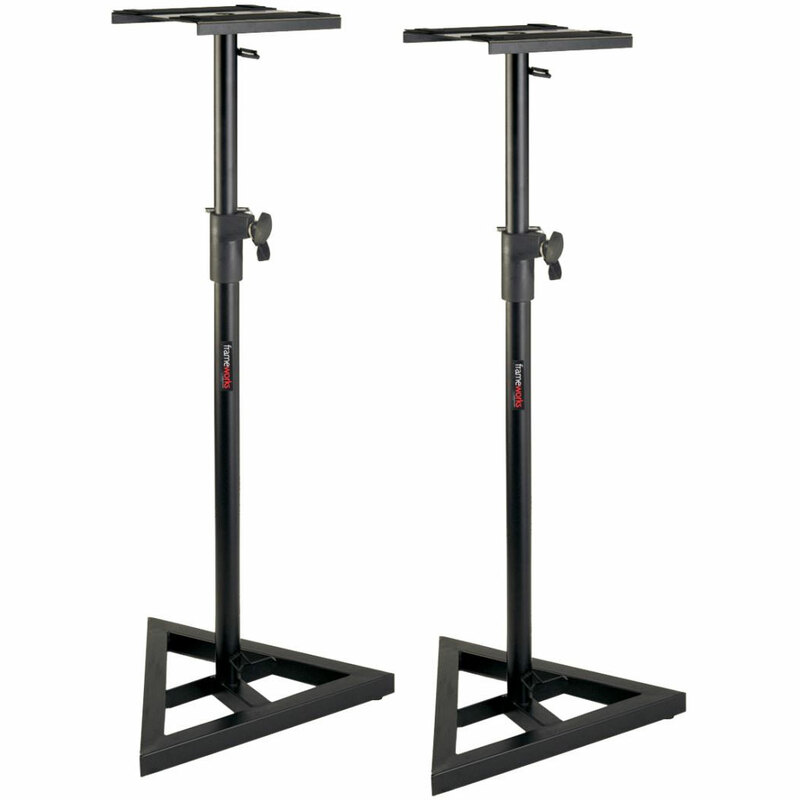 Either way, to make the most out of your studio monitors it certainly helps to have them at a sensible height and angle in relation to where your listening position is. Floor-standing studio monitor stands are probably the easiest way to achieve perfect height alignment for your monitor speakers, that’s if you have the space behind or next to your workspace. 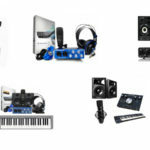 Small home studios may not have the luxury of moving the desk away from the wall, and may have to go for desktop stands, otherwise for those of us who do have the space – most of the options in the budget category share a similar design, the major differences are the size and build quality. 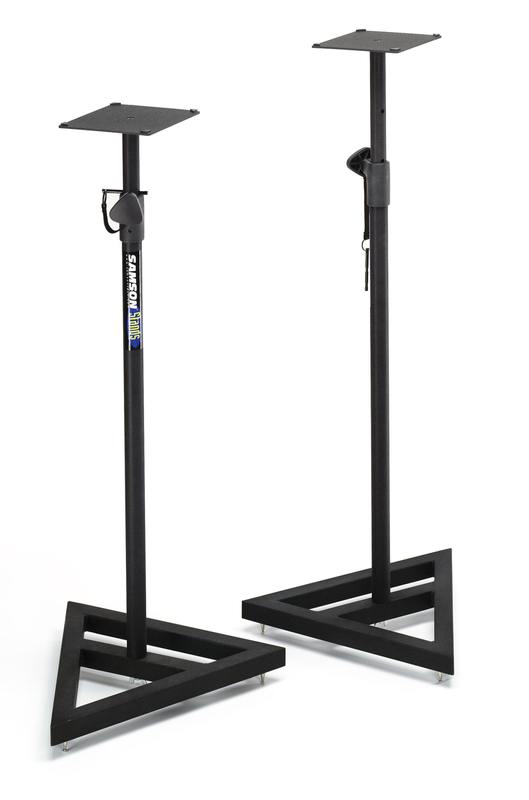 The Samson MS200 feature adjustable height and a heavy-duty triangular base. They’re pretty light-weight compared to some of the other options, however they’re well-constructed and should work for smaller monitor setups. The stands feature non-slip isolation pads to reduce vibrations and unwanted mishaps and they’re capable of holding up to 20kg capacity per stand. These guys are slightly more heavy-duty than the previous option, offering a larger base and platform. 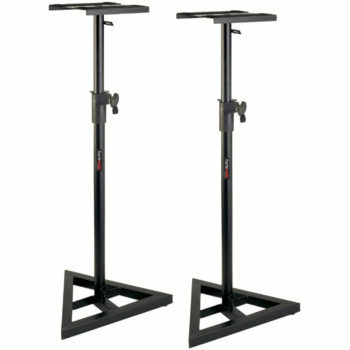 I would consider these to be the premium in the affordable monitor stand category. They’re incredibly well-constructed, sturdy and offer plenty of support and have a professional aesthetic about them. For those with a more confined studio space, or certain limitations to work around – desktop studio monitor stands are the way to go. They’re also a great way of decoupling or elevating speakers above a mixing console, if you’re using an analog console in your studio. The Auralex MoPADs are a set of foam blocks with several configurable tilt angles depending on how to stack them. 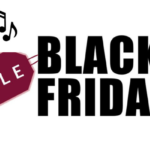 They support vertical and horizontal speaker placement and various sizes and models of studio monitors. The Auralex MoPADs are not only for speaker placement, they reduce structural vibrations between the speaker and desk drastically, resulting in a more accurate response. 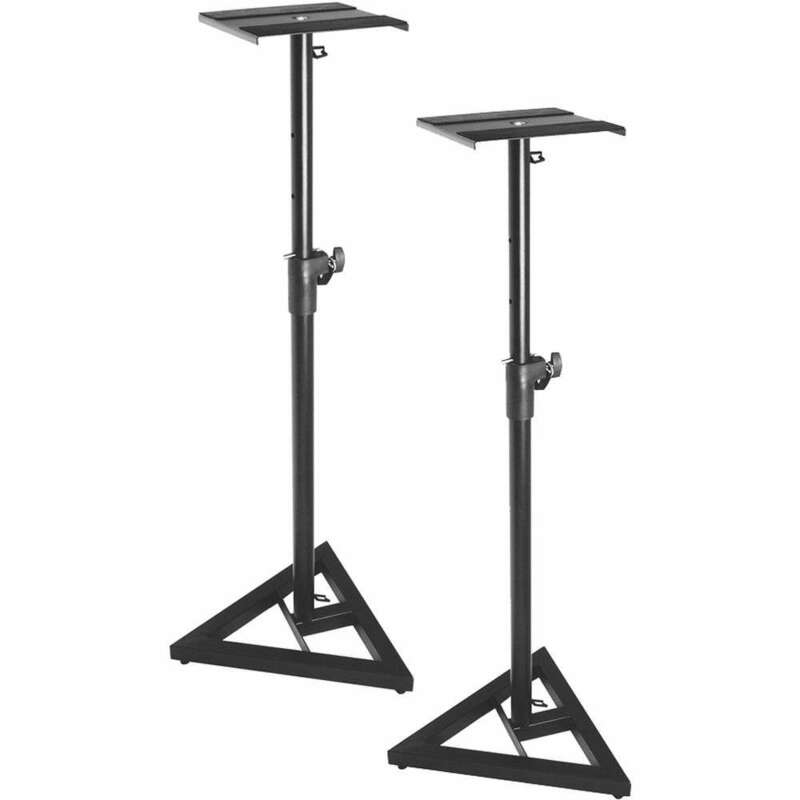 In terms of height adjustment, these are probably the most configurable of desktop studio monitor stands, they also allow for various tilting options and structurally they’re quite a bit more rigid than foam. 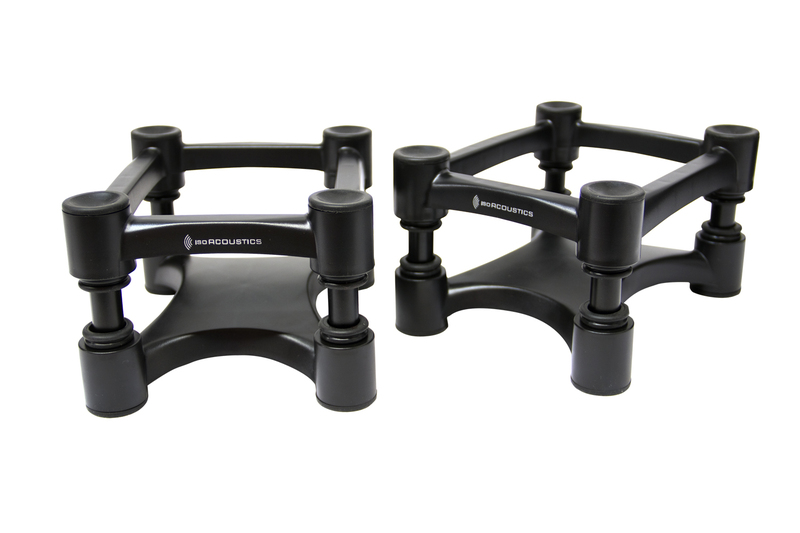 The IsoAcoustics L8R range is available in various shapes and sizes, allowing you to make the most of multiple speaker setups. They’re incredibly configurable and sturdy. If you’re looking for a premium set of desktop stands, this would be my pick. 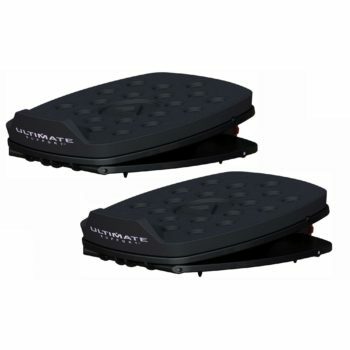 They’re adjustable and incredibly sturdy and well-built. They don’t offer much height adjustment; however, the varying tilt makes up a bit for that. 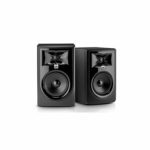 The MS-80B are incredibly sturdy, they have a thick foam layer to absorb vibrations and there’s an adjustment at the back to dial in just the right amount of tilt needed to aim your studio monitors directly at your ears. 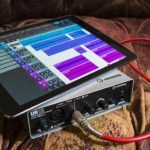 The acoustic response of the room is also a huge factor in making the most of your studio monitor setup, however that is a topic all on its own. 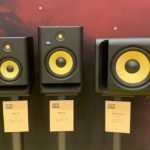 For a user-friendly, easy-to-use acoustic calibration system to get you started before investing in professional treatment – I highly recommend Sonarworks Reference 4, check out the review we did on the system.